For older adults, failing to eat properly can be a major warning sign of an underlying health issue. And for caregivers, it can be hard to watch as your parent turns away meals, visibly loses weight, or lets the contents of their pantry spoil. From prescription medications affecting appetite, to changes to their sense of taste or smell, to physical or mental changes that make it harder to navigate a kitchen, there are all sorts of reasons why your older loved one may not be eating property. What’s a concerned loved one to do? One way to help may be by getting involved with meal prep! Assisting your loved one with cooking meals, often in advance, can make it easier for them to get the nutrition they need, with less of a fuss. As we get older, a loss of appetite is perfectly normal, and to be expected. For that reason, it may help to think more about meal prep in terms of nutrient density, rather than portion size. In other words, how can you serve up the right amount of nutritious, healthy calories – without overloading your parent’s plate? A few areas to focus on might be protein and whole grains. Protein packed foods can help slow muscle loss and keep your elderly loved one from feeling too weak, and can come ready to serve in the form of nuts, Greek yogurt, mashed avocado, eggs, tuna fish, or even a protein powder added to smoothies or juices. Meanwhile, whole grains can help with heart health and digestion. Practical sources include microwavable brown rice or make-ahead oatmeal. And don’t forget nutritious, vitamin-loaded fruits and veggies! One hurdle to proper nutrition for many seniors is having to prepare their own meals from scratch, which can be time-consuming and physically demanding. That’s one reason why meal prep is so important in the first place! Having things prepared and ready to go can go a long way toward helping your loved one eat properly. With that in mind, consider your loved one’s unique needs, and think about all the ways you can make it as easy to eat as possible. For instance, many older adults have problems with chewing and swallowing, so you may want to focus on preparing softer foods. In other cases, this might mean packaging foods into “grab and go” portions, with little to no cooking time or effort required. For example, preparing easy-to-microwave bags of veggies can help your parent eat soft, chewable vegetables, no slicing, dicing, or boiling required. When it comes to eating right, getting your parent on your side may just be half the battle. With that in mind, try to listen to your parent’s wants and needs, and be respectful of their food preferences. For instance, if your parent is losing some of their senses of taste or smell, they may want to up the spice or seasoning level on their food. In other cases, some might go the opposite direction, and prefer things with less seasoning. Getting those little details right can make a big difference for getting a parent to eat better. In some situations, healthcare professionals might recommend a prescription appetite stimulant. This may be a necessary step to get some people eating. For others, a little bit of activity can help get the appetite working again. Going for a walk around the block, running errands, or even just moving more around the house can all help your loved one work up an appetite, and can help with related issues, like constipation. Going back to what we discussed earlier, your loved one may be more likely to eat more if they feel like their preferences are being heard and honored. 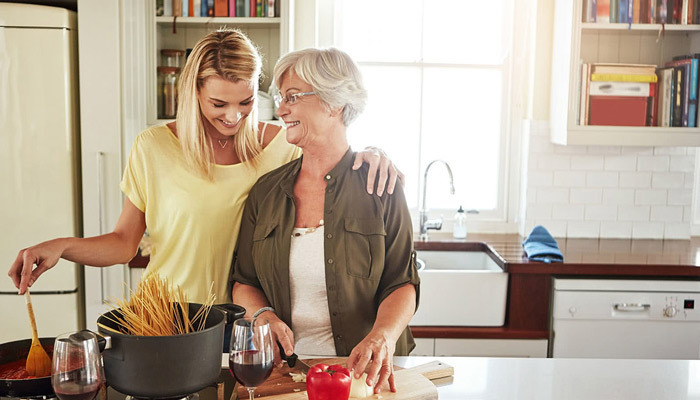 Regularly taking your loved one to the store could be a great way to make sure that your parent is keeping their kitchen stocked – and, more importantly, stocked with foods they’re more likely to actually eat. Don’t have enough time to regularly take your parent shopping yourself? A professional caregiver may be able to help your loved one develop a shopping list, give them a ride to the store, and even help with meal prep. Don’t have time to cook or shop for your loved one as often as you’d like, but still want to make sure that they have a full pantry, or even prepared meals? There are more meal and food delivery services available to seniors than ever! Amazon, Whole Foods, and other retailers offer grocery delivery, for example. There are also plenty of restaurants, companies, and non-profit services that offer full meal delivery to seniors, often on a schedule that you can set. Finally, remember that eating and drinking can be a lot more fun when you’re doing it together! So many holidays and celebrations are built around meals, and for good reason. With that in mind, try to help make it easy for your loved one to share their meals with family or friends. Can you take your loved one out to eat at a restaurant once a week? Or share a meal at home? Can you arrange a regular dinner, maybe with parents’ friends in the neighborhood? Again, a professional caregiver can help here as well! Sometimes, all it takes is a great conversation with a warm, smiling face to encourage your loved one to eat better. Does Your Loved One Need Help WIth Meal Prep? A Dining Companion? At Companions for Seniors, we understand the impact a social mealtime has on overall health for seniors and we make it a point of emphasis when it comes to the care we provide. We don’t look at cooking for our clients as a chore, but a privilege and an amazing chance to connect and hear their amazing stories. When our caregivers cook and share meals with their clients, they talk about their day, share stories, and, most importantly, create a bond. We often hear that these shared meals become highlights for not only our client, but the caregiver as well. If you have a loved one that could use a home cooked meal and some company, we’d love to be the ones to provide it. Our professionally trained, bonded, and insured Companions offer flexible hours and personalized care plans, and can help your loved one maintain their independence and a higher quality of life. We offer meal prep services, companionship, and driving services, to assist your loved one with grocery shopping or running errands. Have any questions? Want to get in touch? Contact us today through our website or give us a call at (866) 910-9020 to get the conversation started! Thank you for sharing on how to do your elderly parents with their meal.